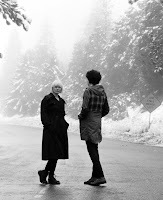 Sharin Foo and Sune Rose Wagner, better known as The Raveonettes, have announced t hat their new record. Raven In The Grave will be released on April 5 via Vice Records. To get a taste of what's to come, check out the new song "Forget That You're Young" at the bottom of the post in our MP3 Grab. The Raveonettes will be hitting the road and they'll be making a stop in our lovely city. They will be at Music Hall of Williamsburg in Brooklyn on April 20 and April 21. Check below for a full list of dates. "I think we have finally hit on something quite important and different for this album," explains Sune. "This is the first Raveonettes album we've done which doesn't feature the signature Raveonettes surf drumbeat. None of the tunes have any real sunshine to them. It's all very un-Rave." "It has a mood of ethereal defiance," Sharin adds. "It's dark but not bleak, like the single minded determination caused by crisis that is not quite hope but just as powerful. It's the perfect winter soundtrack just in time for spring".